My family loves anything that remotely resembles Mexican food. Slow cooker carnitas? The best thing since sliced bread (which is saying a lot, since they’ll devour a loaf of No-knead Artisan Bread in one sitting!). Homemade blender salsa? I’ve never bought salsa since I first made this recipe years ago. 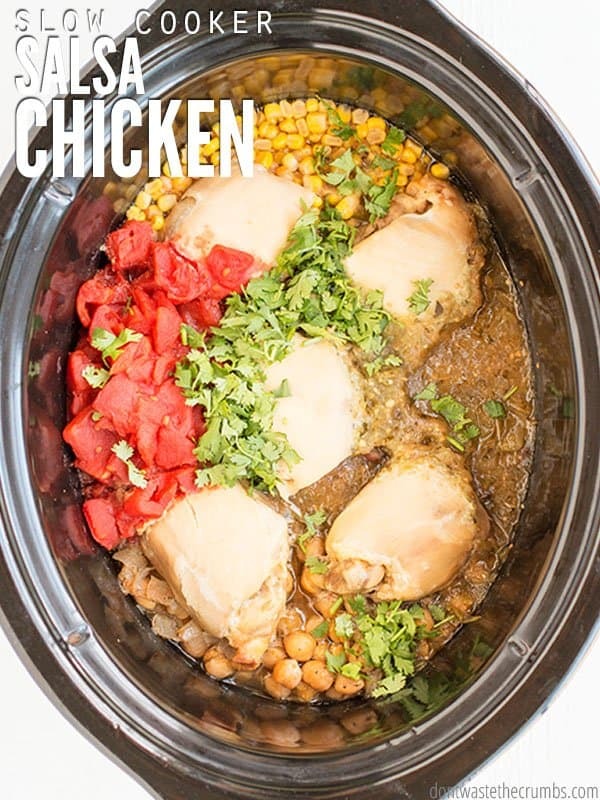 Slow cooker salsa chicken? My go-to Mexican-like dish when the pantry is looking sparse and the grocery budget doesn’t reset for a few more days. … BUT I know that when I combine salsa, corn, black beans, and garbanzo beans together, the family never complains about dinner. Besides the fact that my family LOVES slow cooker salsa chicken, I love that the ingredients are items I use often in the kitchen anyway. It allows me to stock up on sales (like I teach in Grocery Budget Bootcamp), and I never worry about how I’m going to use up whatever I have. Once they’re cooked, I make whatever dessert hummus the kids are cravings (their choice of chocolate hummus, cake batter hummus or cookie dough hummus). That goes on the lunch menu (for both school and summer). I set aside 1 ½ cups for homemade tortilla soup and if there are still beans left, I freeze them in 1 ½ cup portions. Just like the garbanzo beans, buy them dry, soak overnight and cook in the slow cooker. Cooked black beans go into black bean brownies, which get demolished in 2 days. (Note to self to make a double batch next time and freeze.) These also go on the lunch menu, but are frequently part of after school snacks and even dessert. I also set aside 1 ½ cups for homemade tortilla soup and freeze extras in 1 ½ cup portions. I used to buy the 16 oz jars of salsa verde and when I did, I used up the rest of it in tortilla soup. Now I buy the really big jugs and put tortilla soup, slow cooker salsa chicken, chicken and spinach enchiladas and slow cooker carnitas on the meal plan. This won’t use ALL the salsa, but it makes a serious dent and allows us to finish the jug before it goes bad. It’s not “required” for this recipe, but I always serve it on top and that uses up whatever is left from a container when I make chicken and spinach enchiladas. If the big containers are on sale, I’ll make a batch of lime crema. That’s a must-have on slow cooker carnitas, but it’s good on just about anything remotely related to Mexican. I hear you can put it on nachos, tamales, quesadillas, in a cabbage slaw, and on top of fish tacos. Really, you can’t go wrong with lime crema! You can really use any cut of chicken in this recipe. However, I do suggest skinless and boneless since you’ll be shredding up the meat once it cooks. In the pictures I used thighs but chicken breasts work too. I typically buy my chicken at Costco since they have great prices on organic chicken. But I’ve also tried organic chicken from Butcher Box. If you can’t find organic chicken locally, Butcher Box is a great option. Read more about my experience with them HERE. Exclusive offer for Crumbs readers! Right now get 2 lbs of ground beef + bacon + $10 off your first order with Butcher Box! Butcher Box delivers grass-fed beef, pasture-raised and organic chicken, and heritage pork directly to your front door each month. You can read my honest review on Butcher Box here, and also my updated Butcher Box review here. Who would pass up on free meat! CLICK HERE to get your offer! First, it’s kind of messy. Like, everything just kind of mixes up together when it’s cooked in the slow cooker (see above picture). If you have everything you need to make cornbread, please make that instead. My family LOVES this recipe. Something about the corn bread mopping up the juices from this recipe is just heaven in your mouth. Third, definitely wrap up the leftovers. As in, wrap them up in a tortilla. I prefer homemade flour tortillas personally, with a few dollops of sour cream along the way and shredded cheese on top. It’s a fantastic way to eat leftovers that are all mixed up (and therefore probably not pretty). Plus since it’s not EXACTLY the same thing as dinner, leftoverphobiacs need not complain. This meal is PERFECT for the freezer – dump everything in a gallon freezer-safe bag and seal it up! 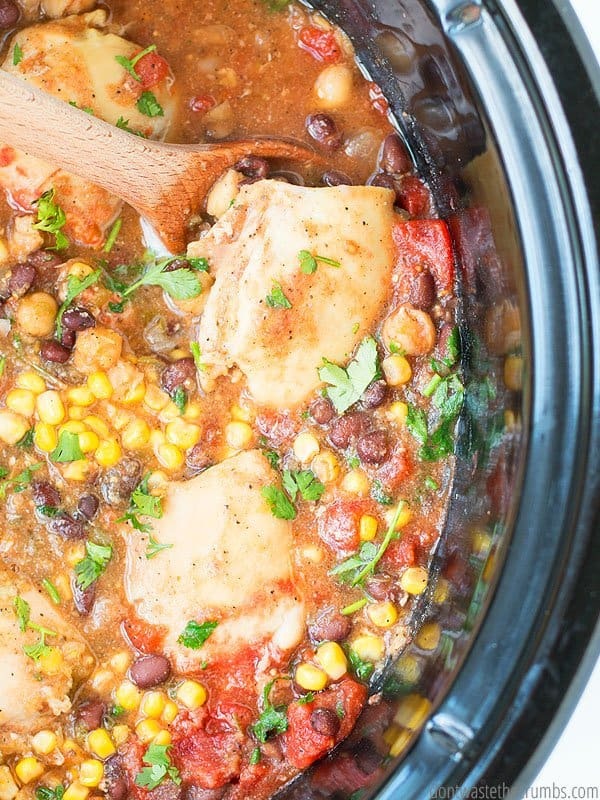 When you need dinner, dump it into the slow cooker! So this is exactly why I included it in my Dinner Dump Freezer Cooking Meal Plan along with 4 other easy dinner recipes. You can find this recipe in our Dinner Dump Freezer Cooking Meal Plan along with 4 other easy dinner recipes like the Very Best Slow Cooker Carnitas, and Beef Ragu, and Sheet Pan Sausage and Peppers and Homemade Hamburger Helper HERE and have 10 dinners ready in just ONE hour! This meal stretches really well with a side of Spanish rice and refried beans. Heads up that my favorite refried bean recipe is also made in the slow cooker, so be sure to make that the night before! Did you know you can turn this into an Instant Pot recipe? Use these conversion tips! 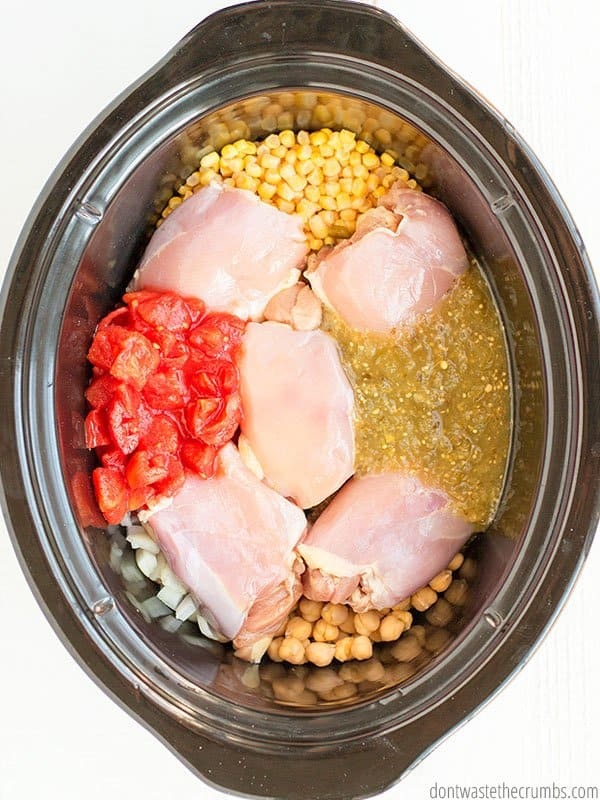 Place all ingredients in a large slow cooker* and cook on low for 4-6 hours. Serve over rice, homemade cornbread or with homemade tortillas. 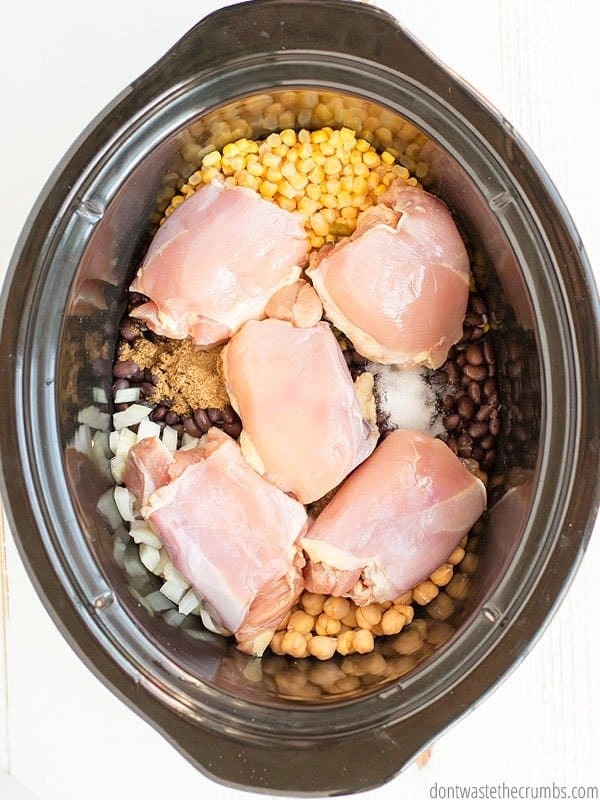 * I have this 6-quart slow cooker and this recipe fits with room to spare. I don't recommend using a slow cooker any smaller than 4 quarts. Does your family share the same love for Mexican food? What are some of your favorite meals that use similar ingredients? Share your tips below!